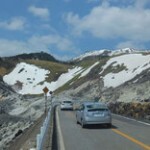 This tour is mountain road trekking to make round trip between Kusatsu Hot Spa and the Shibu Pass, which is at 2,172 m high, the highest point among all National Roads in Japan. On the way, there are superb view spots like emerald green colored crater lake of Shirane Volcano (see note 1), and mountain road along the watershed between Gunma Prefecture and Nagano Prefecture. 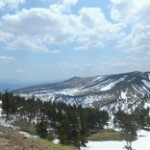 Around golden week in early May, passing through tall snow corridor, just after snowplow, is so fun. Note 1: Due to high level activity of Shirane Volcano started in early June 2014, there is an alert for traffic on Route 292 on the way to Shibu Pass. Please follow the safety advice by B-Ike tour guide. It takes about half an hour by our shuttle from meeting point of JR Naganohara-Kusatsuguchi Station to the tour starting point of Tenguyama Parking Area in Kusatsu Hot Spa at 1,240 meter high. The bike trekking tour is a round trip on National Route 292. 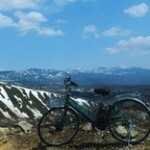 After leaving the starting point, the tour bike aims to Kusatsu-Shirane rest-house at 2,010 meter high. On the way, the route goes through 1,600m high area near the rope-way station, called Sessyo-ga-hara where poisonous gas ejected from earth and all vehicles has to pass the area without stopping. At present, all vehicles including bike also cannot stop and park in the volcano alert zone where rest-house is located. The road from Kusatsu-Shirane rest-house to Shibu Pass, the highest point, is relatively gentle up-and-down slope, but not so steep uphill one. 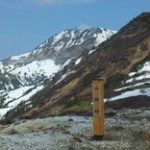 Along with the road built on the watershed between Gumma and Nagano Prefectures, you can have magnificent view of Mt. Shirane and Shiga Mountains. 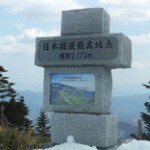 At the Shibu Pass, you can find the stone plate indicating 2,172 meter high, the highest elevation among Japanese National Roads. You might try to go to Yokoteyama Drive-in at 2,100 meter high, and 1.5 km away ahead if enough power is remained in battery. 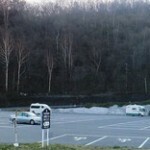 At the drive-in, you can take rest and have view for Northern Japan Alps. On the way back from Shibu Pass to Kusatsu-Shirane rest-house, there are a few uphill slopes, so that, it is better to confirm that battery meter shows more than 10% remained when leaving the highest point. From Kusatsu-Shirane rest-house to the final goal at the parking area, please keep the speed low for your safety by making use of regenerative brake system.